That old adage train them, dont blame them is a sound concept in theory, because no-one sets out to perform badly on purpose. But, inevitably, some do. A fourth reason could be that they simply dont have the right personality type or skill set for the role they are in  but thats a whole different discussion. In a live environment like a contact centre, agent performance can make or break customer satisfaction, brand perception, sales targets, and cost containment. If KPIs are not being consistently achieved, the two most common reactions are to implement training or replace the team members with new ones. As staff replacement is an expensive option, training should always be considered first. Depending on skill sets, knowledge, experience and performance, contact centre team members training requirements will be unique. Each persons training plan should be tailored to suit their specific needs and/or hone their skills, rather than be structured around criteria like seniority, length of service, or mandatory attendance at all training sessions. Training providers  trainers, supervisors, accomplished team members, external courses or providers? Training schedule  repetition of each training session topic  weekly, monthly, quarterly, annually? Measuring effectiveness  how to measure, when to measure, how to reward and consequence of continuing under-performance. Getting each of these factors right is paramount. If training isnt relevant, motivational and effective, the training sessions will be dreaded by participants, performance may not improve, and costs would just escalate. To be effective, there are several elements that need to be considered when planning and delivering training. 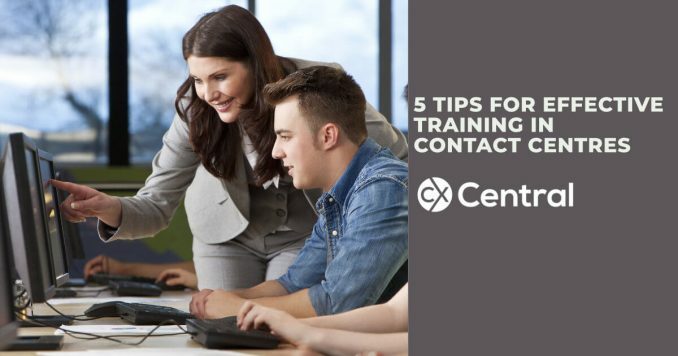 Here are five tips for effective training in contact centres that with planning and implementing training strategies that achieve a positive impact on performance, and help to reduce employee turnover. The first day or two in a new company can often be a little scary for a new recruit. Being paraded through the office while everybody stares, shyly meeting co-workers and forgetting their names a minute later, trying to remembering where the toilets are, and feeling awkward and unproductive is generally the experience and can get worse if the induction process isnt delivered professionally. Ensure new recruits get their security passes quickly and dont have to beg or borrow a pass to go to the toilet. Avoid death by PowerPoint. Swap chalk and talk, death by PowerPoint and screen shots for practical, brain-friendly activities and interactions. Ensure their manager greets them on their first day and welcomes them with a personalised induction pack. It makes such a difference to a new starter; it gives a sense of belonging to a team and shows you have prepared for their arrival. Use buddies to coach and mentor new starters. The buddies should be inspiring and motivational, and trained in effective coaching techniques. Coaching takes some pressure off team managers and provides a structure for skills development and succession planning. Changes in market forces, products, policies and procedures, and technology mean that regular training will be required to ensure all team members are up to date. Short and snappy buzz sessions are effective for this type of training. Nigel Webb, Procter, suggests holding buzz sessions on a variety of topics, two or three times a week. It gives team leaders an excellent opportunity to help their teams engage with the business, and puts the solution at the heart of the customer service representatives (CSR) life rather than letting it get siloed into a training activity. In addition to team leaders holding the buzz sessions, also consider getting different members of the team involved in delivering these sessions, to provide a platform for personal development and increased involvement. Upskill training is an effective strategy for keeping staff engaged. Sally Earnshaw, Calcom Group warns that the role of customer service representative can be monotonous, particularly for those who have been in the role for some time. She suggests that one way to energise and engage agents is through a program of training. Look at multi-skilling agents to provide a broader range of activity and responsibility. This not only improves morale but also has a positive effect on customer satisfaction through higher levels of first call resolution. From a skills perspective, creating and delivering short skill pills to develop team members skills  in particular in areas such as impact, call control, sales and so on  adds another dimension to personal development. There are generally three types of trainers in this world. Those whose real-world performance was mediocre, but are good at instructing others on what to do and embarked on a training career. Those whose real-world performance was excellent, and have been encouraged by management to train others, but in reality, they dont have the personal skills and/or patience to be good trainers. Those who have both the performance track record and genuinely enjoy helping others. The third type of trainer is your ideal candidate, as he or she will have the most influence and earn the most respect. Sending them on a Train-the-Trainer course will give them the structure and skill set to impart their knowledge succinctly and get the best out of those that they are training. Anurag Kull, Dish TV, recommends getting feedback by way of a training feedback form, end-of-the-program quiz and impact of training surveys. The feedback or evaluation process can cover the following features: quality of the program, the relevance of the program, evaluation of the trainer and impact of training. He also advises that knowledge management is crucial and that their strategy for knowledge management is to hone your skills to perfection and learn something new every day. This is because the only long-term competitive advantage for any organisation is the collective brainpower of its people. Training is an integral component of life in a contact centre. Well-planned and -executed training keeps team members engaged and motivated to perform, improves their effectiveness, and reduces staff turnover. And those outcomes significantly impact the achievement of KPIs and customer experience.